I woke up early, as I usually do, and stepped out onto the balcony in time to see the sun rising over the horizon. Built in 2002 for Switzerland's national exposition, the Hotel Palafitte was meant to be a temporary installation, remaining at its currently location only until the fall of 2003. Instead, this unique architectural structure has been preserved at its original site. 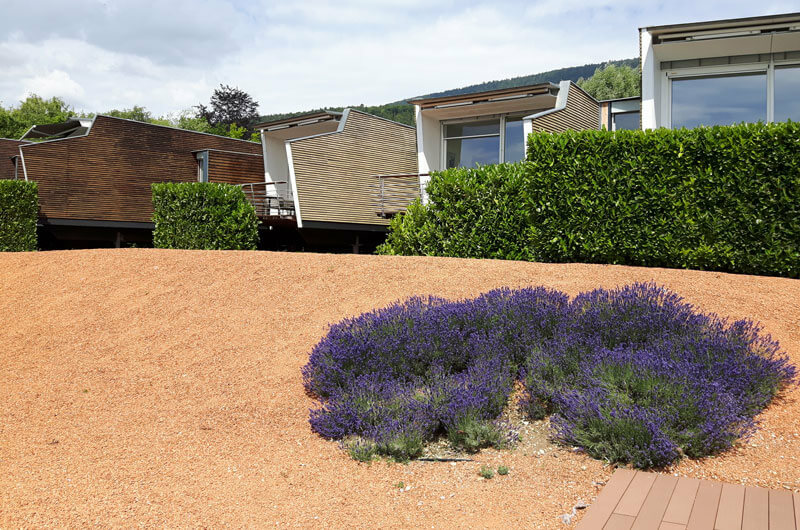 It has the surprising distinction of being the only hotel in Europe built on stilts. 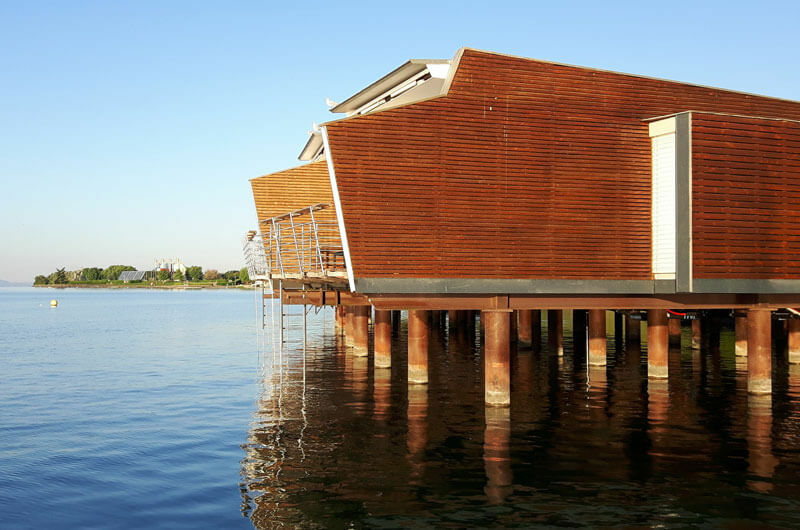 The construction of the Hotel Palafitte pays homage to the ancient pile dwellings discovered nearby, which you can learn about at the Laténium — an archaeological museum located within a 15-minute walk from the hotel. Each of the bungalows contains a display case with artifacts lent by the museum. For example, our bungalow had items from the Bronze and Neolithic ages, all found in the neighboring village of Auvernier — which also happens to be where Yves Chavaillez, the hotel’s Manager was born and raised. In addition to the private bungalows, you will find a full-service restaurant — La Table de Palafitte, which includes a bar and spectacular terrace overlooking the lake. The restaurant has undergone some changes in recent years. In 2014, it reopened after a complete renovation. Also, a new chef signed on in March 2015 — David Sauvignet. Last fall, the Gault & Millau guide awarded the restaurant 14 points, an increase of one point over the previous year. When my husband and I first enter our lake side bungalow, we are struck by how spacious it was. The spaciousness is enhanced by the floor-to-ceiling sliding doors opening out to our balcony. The deck has a sleek and modern feel with comfortable furnishings, primarily in earth tones and accented by nautical blues and greens. A large black and white photograph of a tranquil lakeside scene hangs above our sofa. 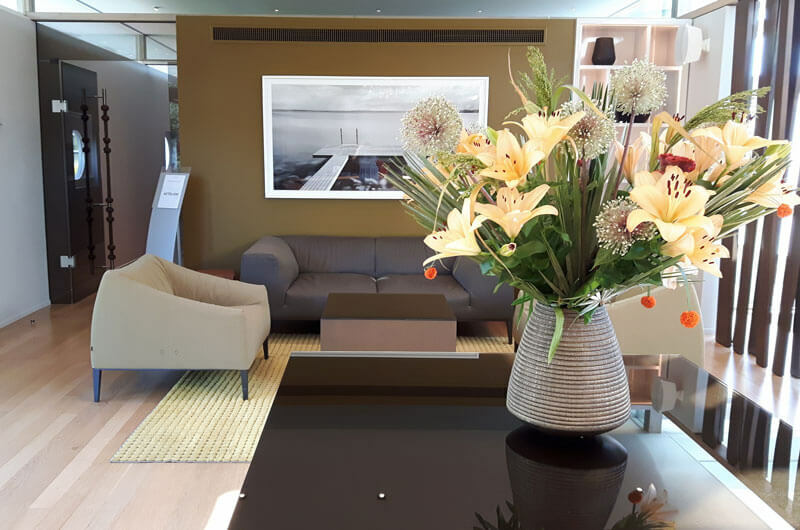 Throughout the hotel, you will see impressive images like these taken by Geneva based photographer Didier Jordan, who I had the chance to meet at a press event at the Hotel Palafitte in July 2016. 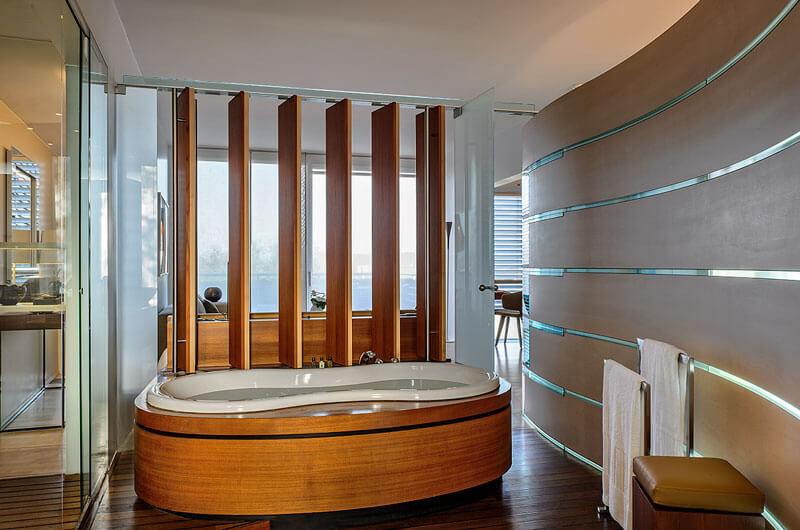 With an enormous bathtub, the bathroom also features beautiful wood paneling, floors and vertical shutters that allow you to see the lake while you are bathing. On a marble topped table, I find an envelope for us containing a handwritten welcome note, along with a bottle of local rosé chilling in a bucket of ice. 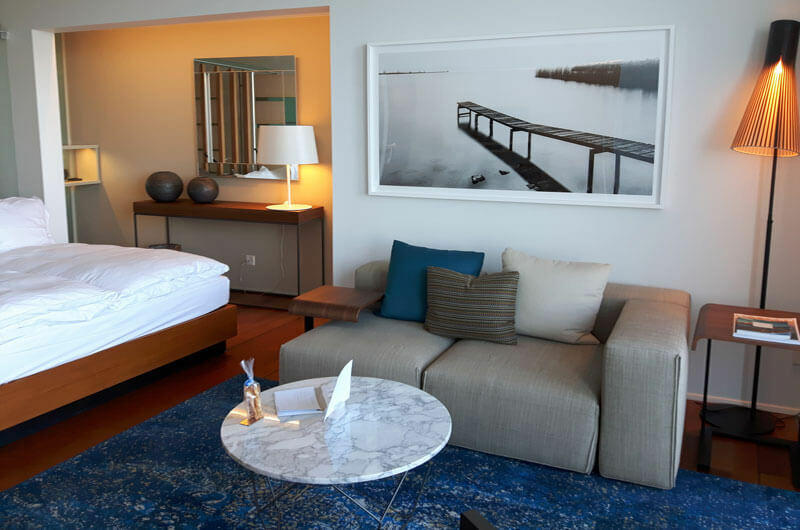 Hotel Palafitte certainly gave me a good first impression, and I really felt a sense of calm and relaxation being in that luxurious bungalow. Plus, with the beautiful weather, I was thrilled to spend time on the balcony, simply enjoying the sunshine and the views of snow-capped mountains. 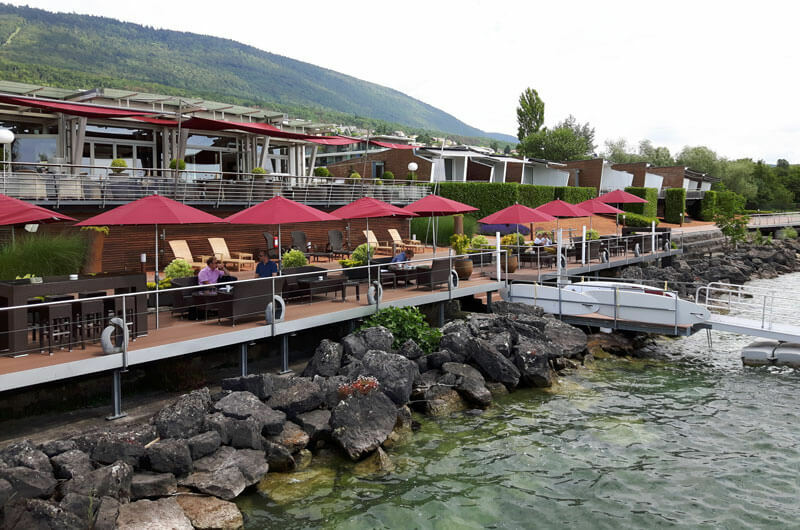 At La Table de Palafitte, we enjoyed delicious meals and, in my opinion, one of our best dining experiences in Switzerland in terms of customer service. That evening, my husband and I had a lovely dinner on the terrace. My three-course meal featured produits du terroir from the canton of Neuchâtel, like jambon de Vaumarcus, brochet (pike) and absinthe. After a good night's sleep, we have breakfast outdoors on the terrace. (The mattress was a bit too firm for my liking, but my husband thought it was great.) 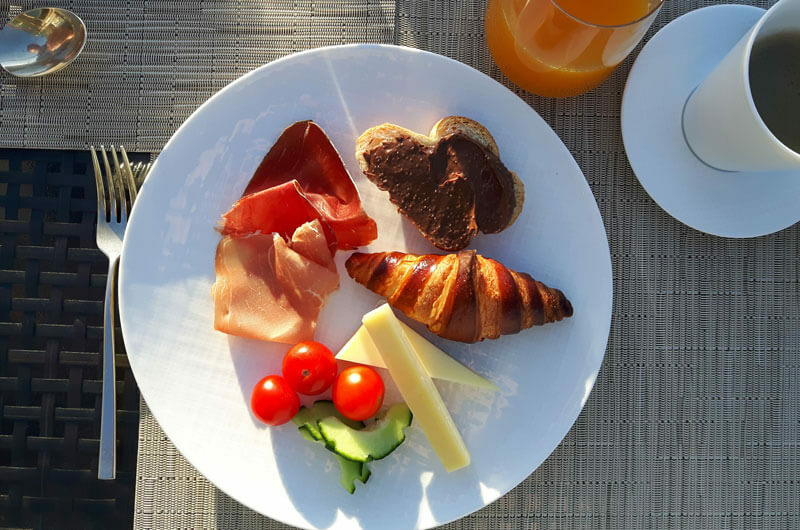 The breakfast buffet emphasizes on local foods, like Britchon cheese and crèmes à tartiner from Jacot Chocolatier (read more about my dining experienceon my personal blog, Cuisine Helvetica). After my leisurely breakfast, I took another swim and lingered as long as possible, lying in the sunshine on our balcony, waiting for the last minute until check-out time. While I had not traveled far from home, I felt as though I had truly escaped to my own private sanctuary, even if just for a night. 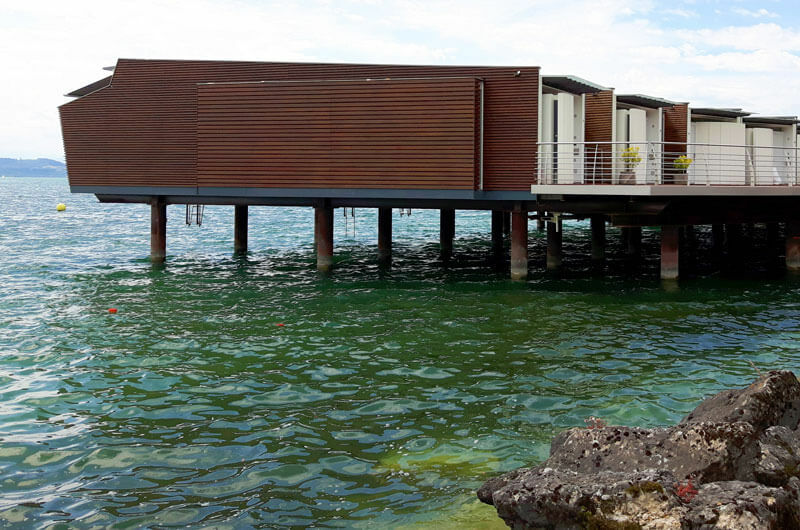 I can guarantee there is no other hotel in Switzerland quite like Hotel Palafitte. 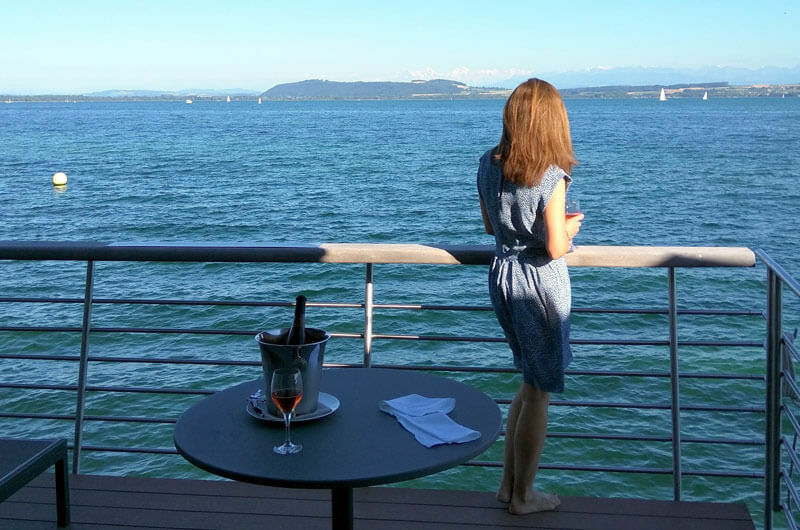 With excellent service, unique architectural features, modern décor, a top-notch restaurant, and a peaceful location on Lake Neuchâtel, I had a very memorable experience staying at this exceptional hotel on stilts. - Bungalows start at around 530 francs per night. Check the hotel website for availability. 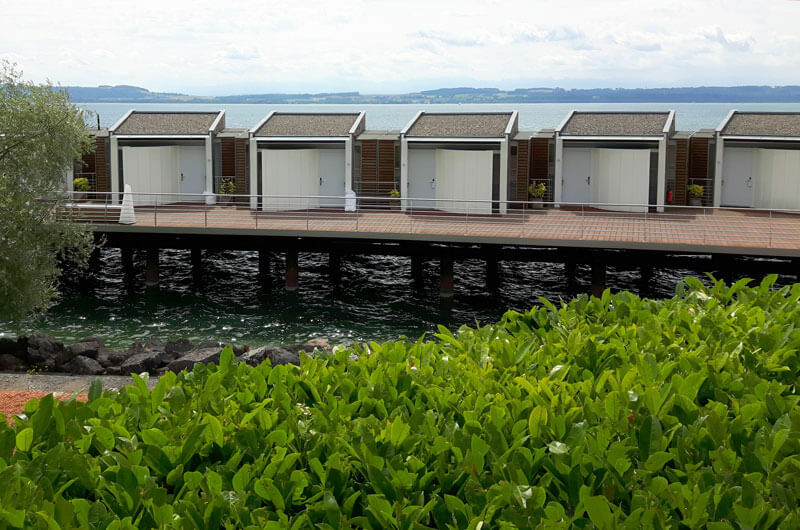 - If you would like to go sightseeing in Neuchâtel during your visit, the old town center is about 10 to 15 minutes by car or bus, and the hotel offers a free transfer service into town.